WASHINGTON — The U.S. Defense Advanced Research Projects Agency is being asked to reconsider a satellite-servicing demonstration mission it plans to put under contract this year. Four U.S. lawmakers complained to DARPA and the Pentagon this week that the project appears to run afoul of a national space policy that discourages the government from developing space systems and services it could otherwise buy from the private sector. Orbital ATK, the Dulles, Virginia-based satellite-and-rocket builder that’s been trying to crack the satellite-servicing business since 2010, sees the RSGS program as unwelcome government competition. The company is sitting out the DARPA competition as it develops — through its Space Logistics LLC subsidiary — a privately-funded satellite-servicing vehicle that signed up its first customer last year: commercial fleet operator Intelsat. Acting DARPA Director Steven Walker received complaints about RSGS from two sets of lawmakers this week. U.S. Rep. Duncan Hunter (R-Calif.) sent his own letters to Walker and Deputy Defense Secretary Robert Work on Monday saying the RSGS program essentially duplicates NASA’s Restore-L mission and muddies the business case for commercial companies. “Putting significant government funding in a program that has no government requirement but is designed to create a commercial industry by subsidizing a single company is counter to U.S. space policy, jeopardizes private investment in commercial satellite servicing business and wastes taxpayer dollars,” Hunter wrote. This week’s attention to RSGS comes about nine months after Orbital ATK’s Space Logistics subsidiary signed its multimillion-dollar contract with Intelsat to provide life extension services for multiple spacecraft over the course of five years. Orbital ATK inked the Intelsat agreement for services with its Mission Extension Vehicle, MEV-1, last April; DARPA issued its initial solicitation for RSGS the following month. Along with Orbital ATK, at least two other companies are pursuing in-orbit servicing business ideas. Effective Space Solutions in the United Kingdom, is building small satellites for life-extension and other services, and Canada-based MDA is weighing a return to in orbit servicing through Space Systems Loral of Palo Alto, California. DARPA, in a Jan. 25 statement to SpaceNews, said the RSGS program “aims to transform national security operations in geosynchronous orbit (GEO) and is in full alignment with U.S. national space policy”. The agency said it is still in source selection for who will be the commercial partner for RSGS. “DARPA’s acquisition approach has been extensively reviewed and verified within the Department of Defense for legality and consistency with space policy. The robotic payload is high-risk, high-payoff technology. A robotic GEO servicing capability that leverages this technology and provides the required functionality does not exist today and is not in development by the commercial sector,” DARPA said in its statement. Orbital ATK disagrees with that claim. In a Jan. 25 statement, the company said it has “strong concerns” about DARPA’s program approach to RSGS. “DARPA’s RSGS program will subsidize a single company with several hundred million dollars’ worth of space hardware and launch service, courtesy of the U.S. taxpayer, to directly compete with commercial satellite servicing systems that Orbital ATK and other companies are developing with their own private capital. Even worse, we estimate that DARPA will provide about 75% of the program funding but retain only about 10% of its capability, a highly questionable and inefficient use of public funds,” Orbital ATK said. According to an industry source, Orbital ATK did not submit a formal bid to DARPA to compete for RSGS, but sent a letter objecting to the program and suggested an alternative approach for meeting RSGS objectives. Air Force disagreements over Phoenix’s utility, which at one point was anticipated to launch in 2016, prompted a revamping of the program in 2015 to focus on more valuable services such as inspection, repositioning of satellites and corrections for improperly deployed spacecraft, demonstrated on a live satellite. 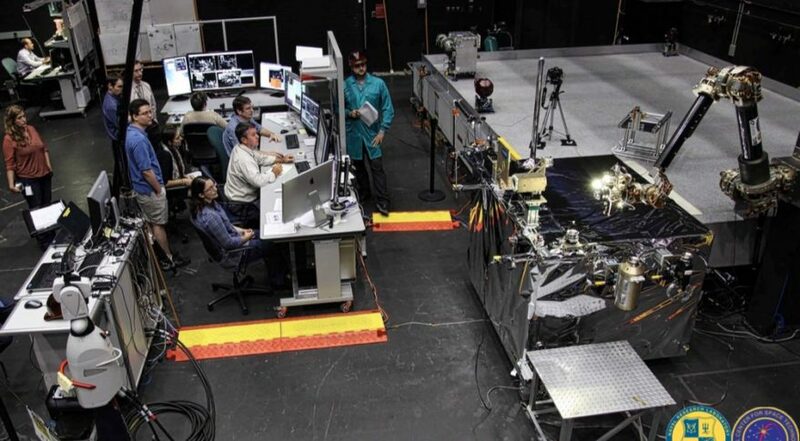 Phoenix, and now RSGS, built of off DARPA’s Front-end Robotics Enabling Near-term Demonstration (FREND) project from 2005, and SUMO, the Spacecraft for the Universal Modification of Orbits, which dates back to 2002. During what is now more than 14 years since DARPA began working on satellite-servicing technology, the commercial sector appears to have taken the lead. In 2010, ATK with partner U.S. Space formed ViviSat, which Orbital ATK turned into a wholly owned subsidiary after Orbital Sciences and ATK merged their space businesses in 2014. That subsidiary, Space Logistics LLC, has a contract with International Launch Services for a Proton Medium launch of MEV-1 in 2018. DARPA’s RSGS is now targeting a 2020 or 2021 launch.